Fertigation Systems are becoming more popular and include such models as EZ Flow, or others. Fertigation systems usually have a small tank (1 to 10 gallon or larger) attached to the below ground sprinkler system and meters out small quantities into the irrigation line each time you water. Your plants receive small amounts of biostimulant each day or as often as you water. If you don't have a sprinkler system, you can still use a fertigation system connected to a water hose or dripline or soaker hose. Fertigation is a great way to automatically apply very small amounts daily for fantastic results, even during hot summer weather. Hose end sprayers consist of a small, quart-sized tank that attaches to a water hose. It works by consistently siphoning out a small amount of product into the water stream. It is good for applying biostimulants or other liquid chemicals onto lawns, gardens, and other plants. For our biostimulants, be sure to purchase a hose end sprayer that does not dilute the product inside the canister, but rather siphons the product straight from the sprayer cup into the water stream. Any product not siphoned out can then be poured directly back into the product bottle. An example of this sprayer is the "Gilmour 362 Professional All-Purpose Hose End Sprayer". These are small pump-up garden sprayers found at any home and garden store. Most homes have one. Backpack sprayers hold more and are heavier due to a larger tank, but is carried like a backpack. Remember, if you already have a sprayer and have used it to spray herbicides, make sure you clean it out with ammonia and water first before spraying biostimulant products, or any other product, on plants. Ammonia will neutralize most chemicals. Any herbicide left in the sprayer, even small amounts, can harm your plants. You can use a sprinkling can to water you plants and flowers. Simply pour in the measured amount of plant biostimulant and fill with water. Lightly sprinkle over plants or saturate roots with water/biostimulant mixture. For large container plants, put an ounce of biostimulant in two gallons of water and soak soil/roots in container. You will love the results. Many products, including biostimulants, can harm more delicate leaf foliage of plants grown outside when product is applied in HOT summer weather. Hardy plants include lawn grasses, most woody stemmed plants, such as azaleas, shrubs, trees, etc. Rarely will these plants be harmed in hot weather. However, be cautious when temps are above 95 degrees. All Natural Turf Formula is specifically designed for home lawns, parks, schools, and high quality, high maintenance turf. Mix 2 to 4 oz into one to two gallons of water to cover 1000 sq. ft. Be sure to water regularly. Microbe activity will be greatly increased and they will need moisture to maintain the highest activity level. For routine maintenance, apply once a month on average. For high maintenance turf, apply twice a month. For "Cool Season Grasses", apply the heaviest amounts in the fall when root growth and nutrient absorption is at its highest. Also apply in the spring as air temperatures are in the seventies. This is when microorganisms are moving from dormancy to high activity. Applications can be made in summer if irrigation or rain is adequate. For "Warm Season Grasses", apply once or twice a month during the growing season. Be sure grass has ample irrigation for expanded root growth and high soil microorganism activity. Mix 1 to 2 oz (up to 4 oz for trees and grass) in one or two gallons of water. Lightly mist plants. In summer, use 1 oz rate or less per gallon of water on delicate plants. If you are unsure, always test first. Outdoor plants and Trees - Cool Weather: In the cool weather of spring and fall, you can apply the heavier recommended amounts. Spray the entire plant. Follow by irrigation of soil is dry. Outdoor Plants and Trees - Summer Weather: In hot weather, do not spray delicate plants (flowers) or spray in the evening when the temps are lower. Use the lightest rates. Do a spray test on one plant if you are unsure. Be sure you water the plants well. Hardy plants and trees can be sprayed in the morning or evening. Water all plants well. Fruit trees apply at heavy rate before and after spring bloom and a lighter rate a month before harvest. Apply Super-cal liquid calcium in the fall and winter just before spring. Check out the Bill Bader Interview - Largest Peach Orchard in the Midwest to see how to use AgriGro products on fruit trees. Landscape trees apply as needed in the spring and fall. Be sure there is plenty of moisture for biostimulant to work at highest level. Tomato plants should be sprayed in the cooler months and very light rates in the summer. Use a capful (approx. 1 Oz) in one or two gallons and apply to the roots. You can also spray in the coolest part of the day. Most other vegetable plants can receive light rates in the summer (1 oz per gallon) 7 to 10 days apart applied to the soil or sprayed in the coolest part of the day. Always test first if you are unsure. Foliar Blend is scientifically designed for farms, commercial orchards, nurseries, parks, large estates, homeowners, anyone who requires the highest quality biostimulant. Field crops can receive biostimulant at 1 pint per acre. The three main times for spraying is at seed planting, vegetative growth stage, and at the reproductive stage. It can be applied more often depending on how often you spray. It can be tanked mixed and applied with most other chemicals or fertilizers or in sprinkler systems. For fruit tree, mix one to two pints with 35 gallons of water or one or two ounces per gallon for small tanks. Fruit trees can be sprayed in the spring before blossoms, after bloom, and again before harvest. In the fall and winter just before spring, apply super-cal liquid calcium*. Check out the Bill Bader Interview - Largest Peach Orchard in the Midwest. Bill has used Foliar Blend for over 20 years on 110,000 peach trees. Vegetable gardens, community gardens, etc can apply Foliar blend Biostimulant at 2 oz per gallon every 10 days in spring and fall. 1 oz or less than 1 oz in the summer on delicate plants. Apply 2 oz on hardy plants every 7 to 10 days. Landscape trees should be sprayed in the spring before bud break or before tree blossoms. Spray again at or before surge growth periods and in the fall at root growth periods. Heavier rates can usually be used except in high heat. You will get fantastic results on flowers. Apply a metered rate in the drip line, or spray 1 to 2 oz per gallon in the cool part of the year. It can be applied every 2 to 4 weeks. In summer, apply 1 oz per two gallons of water in the coolest part of the day, especially evening. For small flower gardens, it may be easier to use a capful in a two gallon bucket of water and saturate the roots. Mixing rates for IgniteS2 are the same as Foliar Blend. Please see Foliar Blend above. 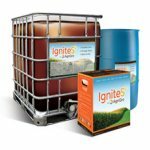 IgniteS2® can be tank mixed, used in sprayer or backpack sprayer and targets the soil and plant's biological system. This effect improves soil structure, promotes healthy soil for better growing conditions, increases fertilizer efficiency, supports vibrant and robust plant growth, and boosts yields. Spray over seeds or fertilizers or prepared ground before planting. Apply 2 to 4 ounces per gallon for lawns, trees, shrubs, and hardy plants. Apply low rates (1 oz per gallon) to more delicate plants in hot weather. Low rates should be used in summer. Many flowers species naturally struggle in summer heat, which is a clue it is heat sensitive. Very low rates can be used with fertigation or hose end sprayers all summer since it can be metered at low or very low rates. Very low rates are below one ounce per gallon. Super-Cal Liquid Calcium is a highly soluble, immediately available calcium (lime). It can be mixed at 2 to 8 oz per gallon per 1000 sq. ft. and can be mixed with biostimulants. Minimum water to product ratio is 5 to 1 or 5 parts water to 1 part calcium. (i.e. - 5 gallons water to 1 gallon calcium; 10 ounces water to 2 ounces calcium) These are the minimum water to product ratios. Water is the carrier so as long as you are getting the correct amount of product per acre or per 1000 sq. ft. as much water as you need or want is better. For pastures, the rate is 2 to 5 gallons of calcium per acre depending on your needs. Similar ratios for field crops. Large orchards can apply at 1 gallon calcium to 5 gallons to 35 gallons of water in spray tanks. Super-Cal can be mixed with all biostimulants and is recommended with most applications of biostimulants. In low pH soils or where soil calcium is unavailable, mix at heavy rates, especially in the spring and fall. 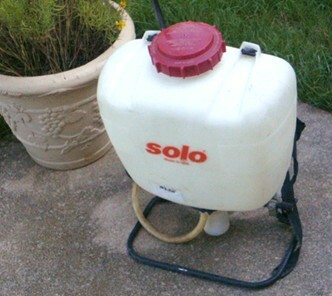 Lawns and trees can be sprayed at 4 to 8 ounces per gallon in the cool season. Water it into the soil so it can be absorbed into the roots. Soil microorganisms need calcium to reach and maintain highest activity levels. Use 2 to 4 ounces per gallon. Apply to soil before planting and occasionally throughout the growing season. You can apply highest rates in fall or before planting so it can start breaking down solid lime so it is there when the plants need it. *Very low rates are less than one ounce per gallon, i.e. 1/2 oz or 1/4 oz. Very low rates in HOT summer months are to be used on delicate plants. If you are unsure, always do a test on a plant before spraying them. Watch the plant for 24 hours before spraying more. Very low rates can be applied to plants through fertigation systems all year long. **Super-Cal Liquid Calcium cannot be mixed with phosphates, such as glyphosate, the active ingredient of Round-Up, Rodeo, and others. The product will gel. If you are unsure if Super-Cal can be mixed with a chemical, do a jar test first to see the reaction. AgriGro products have been thoroughly tested. See the pictorial and documented results from the 80's and 90's during the early days of the product. Certified Lab and University have put AgriGro through the paces and the results are amazing. Check them out here. Due to how biostimulants work, you will get the best results by applying more frequent low dose applications instead of less frequent heavier dose applications. Virginia Tech, Turfgrass pathology Dept. My experiences with biostimulants confirm this, as well. Lighter, frequent doses on delicate flowers. Did You Know...AgriGro All Natural Biostimulants pick up where fertilizers leave off. They can make your plants more disease and drought resistant, increase nutrient uptake, increase photosynthesis, increase root mass, and so much more. For this very reason thousand of farm, orchards, and nurseries around the world use All Natural AgriGro Biostimulants. You should too. Need Proof of Turf Formula's Performance? See This Short Video! A Commercial Turfgrass Grower Demonstrats How Turf Formula Greatly Increased His Quality and Profit Weeks Ahead of Schedule!